A former Universitybus (Hertfordshire) Dennis Dart/Wright Crusader SLF (P664 PNM) has been acquired and repainted into the livery of DW Coaches, and now operates on the company's DerbysCC contracted services. 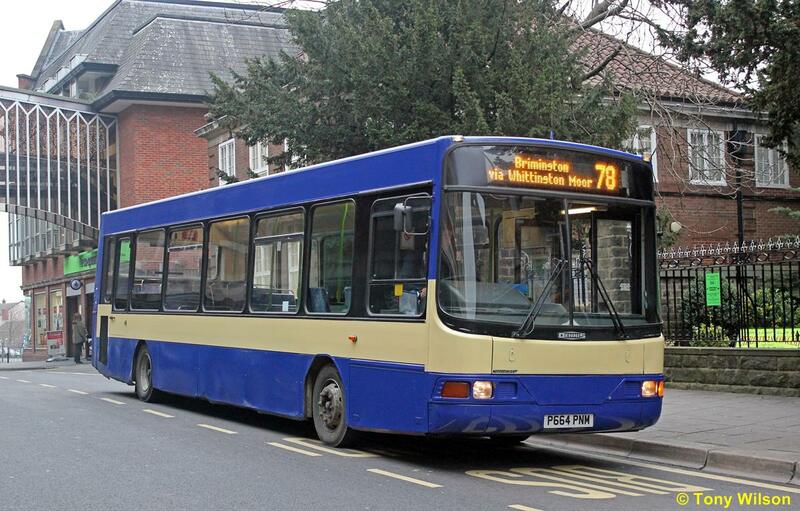 Shown here in Elder Way, Chesterfield yesterday when on the 78 route. That makes three different sorts of bodywork on their fleet of four Dennis Darts, East Lancs, Plaxton and now Wright. The first photo was taken recently and the other photos taken within the first couple of days of the commencement of the contract. All DW Coaches vehicles have been fitted with electronic destinations. Two Darts stand on Cavendish Street Chesterfield on 20th December 2012. Deliveries of Sheffield E400's Commence. How Long is This Train?